Food Adventures of a Comfort Cook: A Tale of Two Chickens. Canned tuna, canned salmon, canned shrimp, canned clams, canned crab, canned chicken, canned beef; are you seeing the trend here and has convenience just gone too far? Or you go into the deli area of your market and see a "salad" in a plastic container; but where are the edible ingredients? Usually there is so much mayonnaise, you wonder if that is exactly what is in the container and nothing else. Mayonnaise for any type of "salad" should be a coating, a simple binder for ingredients, NOT the main ingredient. 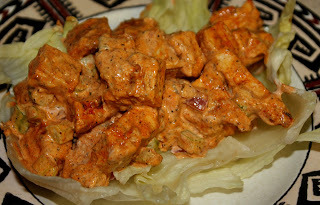 Chicken salad - do you like it with shredded chicken or chunky? Roy and I prefer chunky style; biting into a piece of chicken, knowing how it tastes combined with all the added ingredients. The best way to prepare chicken for salad making is either Rotisserie or Boiled; yes I said boiled. Boiling the chicken does not diminish its flavor; it’s simply a quicker way of removing any excess fat while ensuring the chicken is thoroughly cooked. You want to use either boneless, skinless chicken breasts or chicken tenderloins; nice and meaty! For a serving of two, use four tenderloins or one large breast half (anatomy lesson: chickens have two breasts, so you only need one); place in a small saucepan and add enough water to cover the chicken. Using high heat, boil the chicken until a thick layer of scum forms on the top; skim it off; then place the chicken under running water to rinse off any residue still hanging on. Put the chicken on a plate, cover with plastic wrap and let it cool down in the refrigerator; this will also help draw out any excess water the chicken may have absorbed. Why get rid of the water? To keep your mayonnaise from getting runny; nothing is unappetizing as scooping up salad just to see watery residue at the bottom of the bowl. Yuck! When making the salad, don't get over complicated with ingredients as you want to taste that chicken. I don’t add salt immediately, most mayonnaise brands already have enough in them. After making your salad, taste it and then decide if you'd like extra salt; remember, you can always add, but not take away. Diced red onion is sweeter than the regular white onion, less harsh on the taste buds. Diced celery will give you some color and added crunch, as will the red onion; two tablespoons of each will be just right. Ground black pepper is a flavor enhancer, but use it sparingly (a half teaspoon for two servings) as it can make your salad on the "hot" side of spicy. When cutting the chicken, first cut strips with the grain, then cut your chunks; otherwise the chicken meat will shred apart, unless you want shredded chicken that is. Place the chicken, onion, celery and black pepper into a medium mixing bowl; add four tablespoons of mayonnaise and gently fold together. This is when you can now decide if you would like more mayonnaise or is it just right as it is. If you want more, only add one tablespoon at a time; you want to coat and bind, not overwhelm. When it comes to making a sandwich with freshly made chicken salad, well that's really up to personal preferences. Depending on mood, and what’s in stock, the bread could be a Kaiser roll, sub roll, pita pocket, or two nice thick slices of bread. Fresh, crispy lettuce is the bedding between the bottom piece of bread and the salad; thin slice of cheese like Baby Swiss, Provolone, mild Cheddar or Colby Jack. Slice of tomato, maybe a pickle or two; if that is what you'd like, but personally I don't add so many extras that I lose the essence of the chicken salad itself. Now here’s a bonus, Rotisserie chicken salad, made straight from your own oven. We've seen the oval shaped containers in the supermarkets, better yet, we've smelled the contents and started to drool. Rotisserie chicken is placed on a spit and rotated in a special oven, so the dripping fat can basically baste and moisturize the chicken. Besides selling the chicken as whole or in pieces, many places will shred the meat, mix it with mayonnaise and sell it as chicken salad at a high price per pound. Is it worth it? Not always; there might not be enough seasoning, or too much; same goes for the mayonnaise; and the extra benefits of veggies is iffy, or not even added in. Besides the local supermarket, a rotisserie chicken can be done on the home barbeque. Just purchase the rotating spit, set it up, plug in; yes you'll need an electrical source, and start cooking. Not everyone wants to do this though, but there's another alternative...your own oven. While the recipe focuses on boneless, skinless chicken breasts, bone-in chicken breasts can also be used, but you just have to up the cooking time to 55-60 minutes, or until the internal temperature reaches 165F. Coating the chicken with mayonnaise and covering with foil ensures that the chicken will stay moist inside as well as outside. For the veggies, I use diced onion and celery, but a little shredded carrot or diced bell peppers work too. Preheat oven to 400F; line a roasting pan with aluminum foil and place rack on top of foil. Mix together seasonings and spread out on large plate. Using a pastry brush, lightly coat both sides of the chicken breasts with the 3 tablespoons of mayonnaise; lightly press both sides of chicken onto seasoning mix. Place chicken on rack; cover pan with aluminum foil. Bake for 30 - 35 minutes, or until chicken reaches an internal temperature of 165F. Let chicken cool before cutting into one inch pieces. Place in large bowl; add onion, celery and mayonnaise; mix completely. Serve on rolls, breads, inside pita pockets, rolled in tortillas or as the center piece of a green salad. Need to bring a dish to the next get-together? 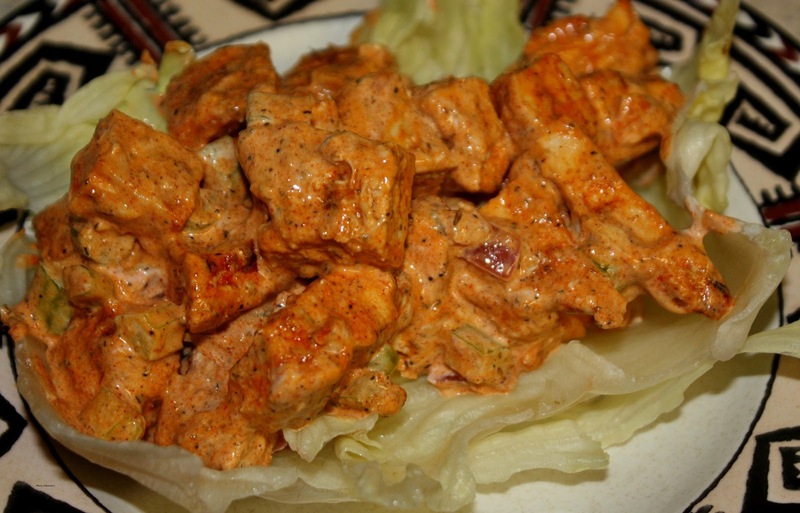 Wow them with chicken salad; just don’t be surprised if it will be expected every time.